love, remember: and there is pansies, that's for thoughts." When it rains and rains your mind can do funny things. Like, all that rain made me think about Ophelia, which made me think about her Mad Scene, which made me think of rosemary, which made me think about food recipes. Which led me to Epicurious and this dish: Sauteed Beef with White Wine and Rosemary. 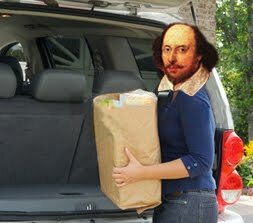 Shakespeare can inspire in many ways, especially when it comes to picking an entree.